Summer patio plants and veg packs now in this April. Find out about our new rewards club, Flourish! Sign up to our mailing list or follow us on Facebook to hear about our new stock arrivals and exclusive offers! Make a day of it and visit our neighbours too! Gift shop, cafe, falconry, patchwork quilting, vintage collectables and art gallery. Bridge Farm Plants is an independent nursery in Suffolk. Whether gardening is your passion, or you just want something simple and easy to brighten up the patio, we have the plants for you. 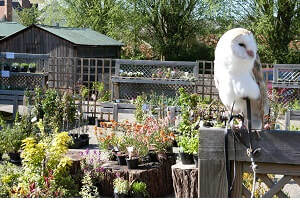 Most of our stock is grown on our sister site, Katie's Garden Plant Centre in Newbourne, east Suffolk, so we can be confident that the plants we sell are strong and healthy and should thrive with the right care. Our carefully selected range includes perennials, roses, lavenders, bedding & annuals, herbs, alpines, climbers, grasses, shrubs, ferns and conifers as well as fruit bushes, vegetables, bulbs and more, depending on the season. We can plant up your tubs and hanging baskets to order and will usually have pre-planted pots and baskets available to buy – perfect for gifts, or as a treat for yourself! Unlike garden centres, our focus is firmly on the plants - with the exception of compost and a small choice of pots we sell nothing else. Our knowledgeable staff offer a friendly, helpful service and buying direct from the grower means you save money without having to compromise on quality.